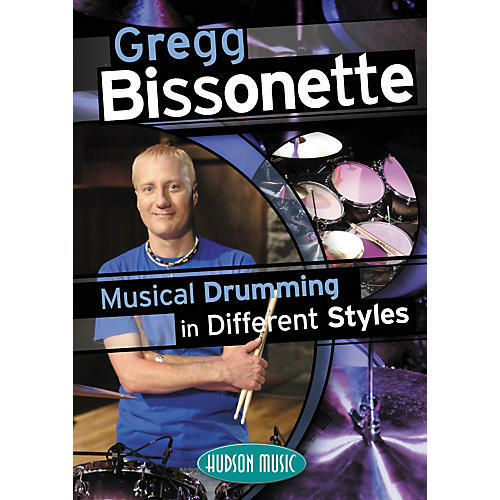 In Musical Drumming in Different Styles, popular drummer and teacher Gregg Bissonette teaches his highly successful approach to creating musically supportive drum parts in virtually any studio or live drumming situation. Drawing on his experience with artists from Maynard Ferguson, Don Henley, and Santana to Toto, Linda Ronstadt, and Ringo Starr, plus his own solo projects, this 4-hour, 2-DVD set defines what playing for the music really means. Includes 8 band tracks from Gregg's 2 solo albums, in small and big band jazz, funk, Afro-Cuban, samba, blues shuffle, fusion, and rock styles. Gregg discusses his interpretation of the music along with the specific drum set-ups, grooves, and fills he chooses, followed by exercises and complete song performances with a topnotch band. Bonus topics include playing odd times and in clave, articulating in fast tempos and with a big band, the importance of being professional at gigs, an analysis of the late Tony Williams' style and influence, and more. DVD features include various camera options, alternate edits to isolate Gregg's bass drum part, printable PDF files with written transcriptions of each exercise/example plus the main grooves and fills from the band tracks, and more!